LOS ANGELES — On Wednesday afternoon, students, faculty, and members of the Los Angeles community gathered to honor and celebrate the achievements of Reverend James Lawson Jr., a highly influential leader of the civil rights movement, friend and colleague of Dr. Martin Luther King Jr. and devoted champion of social justice and nonviolence. During the ceremony, hosted by UCLA Institute for Research on Labor and Employment, campus and community leaders commended Reverend Lawson’s enduring impact on their lives and on the lives of students, workers, and activists across America. The ceremony began with a showing of a clip from “Love and Solidarity,” which introduced Reverend Lawson’s message of love and nonviolence and celebrated his work throughout the years. Following the clip, Darnell Hunt, Dean of Social Sciences at UCLA, took the stage, praising Reverend Lawson’s place in the Civil Rights movement and his role as a mentor to many, including those who have had the privilege to be his students at UCLA. The conferral of the UCLA medal was celebrated with a standing ovation that continued until Reverend Lawson began to speak. During his speech, he humbly paid gratitude to his family and the hundreds of people that helped him during his life. He stressed the message that “life is a gift and a power, and that we must wake up to that life and that power and use it”. He called upon the audience to use the power of life to create change, while reminding them that the way to accomplish that feat is through nonviolence. He also called on UCLA to teach the history of nonviolence, stressing that the University needs to help the rest of the country catch up. He ended his speech with a powerful promise to “stay in the struggle for truth and justice” for as long as he lives. Speakers after the Reverend included Abel Valenzuela, Director of UCLA’s Institute for Research on Labor and Employment; Maria Elena Durazo, CA State Senator; Kent Wong, Director of the UCLA Labor Center; and Mark Ridley-Thomas, Los Angeles County Supervisor. All speakers echoed admiration for Reverend Lawson’s message of love and his dedication to guiding people. Durazo commended Lawson for “transform[ing] the lives of housekeepers and dishwashers and cooks who have been invisible,” and Ridley-Thomas praised the Reverend’s ability to connect with people and touch “deep into the human experience.” Ridley-Thomas also commented that Reverend Lawson’s deep understanding of “the philosophy and practice and theory of nonviolence” and his refusal to give up on nonviolence are the reasons why he is celebrated and honored. At the closing of the award ceremony, Director of the UCLA Labor center, Kent Wong, announced the launch of Lawson Legacy Project. 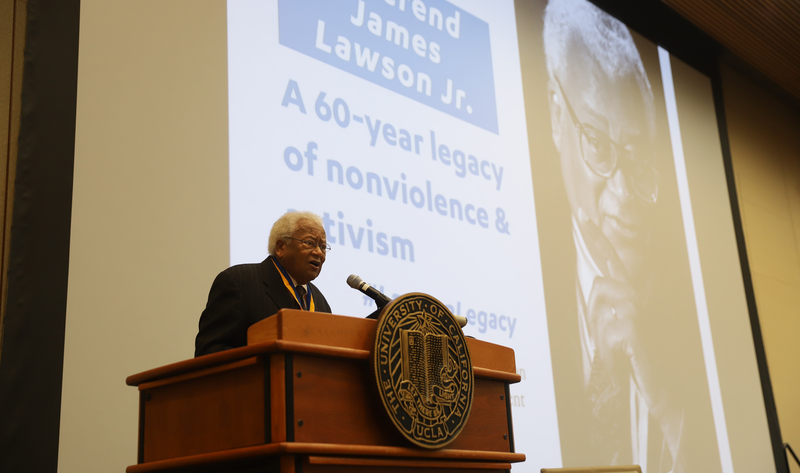 Its goal is to honor Reverend James Lawson Jr. and to keep the spirit of nonviolent activism alive. 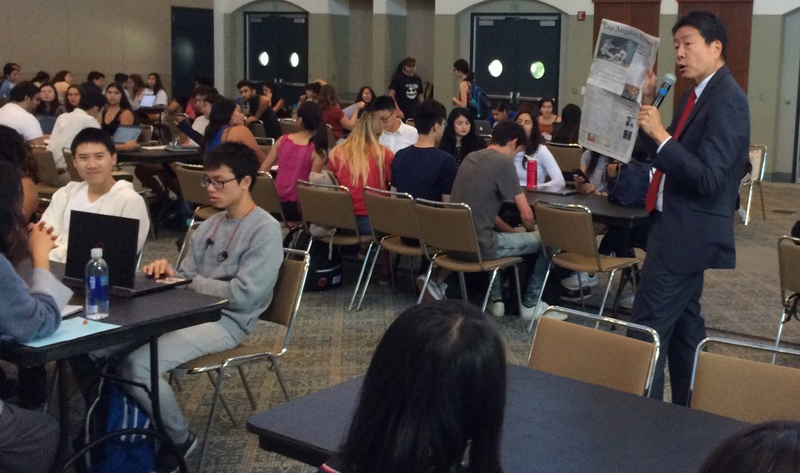 Every year the UCLA Labor Center will invite a scholar or activist to give a lecture on nonviolence. In addition, a scholarship will be given to a UCLA student who represents both the theory and practice of nonviolent activism.